The term “birth trauma” refers to any type of damage to a baby’s organs or tissues from physical pressure or trauma during labor and delivery. It is most often associated with damage to the brain or cranium. Birth trauma differs from “birth injury,” which usually refers to systemic damages that can occur as a result of complications during labor and delivery (hypoxia, ischemia, infection, etc.). Birth trauma injuries can happen as a result of mechanical forces (eg: forceps and vacuum), compression (eg: undiagnosed CPD), and traction (eg: the baby gets stuck requiring pulling) during delivery. If your child has been diagnosed with cerebral palsy, a seizure disorder, or other disability as a result of birth trauma, the compassionate attorneys at Reiter & Walsh ABC Law Centers can help. We aggressively fight for children nationwide affected by traumatic birth injuries. We are one of the only law firms in the country that exclusively takes cases related to birth trauma and birth injury, and our legal team has the deep knowledge and experience with birth trauma cases necessary to win yours. To learn more about the types of cases our legal team takes and wins, visit our list of verdicts and settlements. For a free legal consultation, call Reiter & Walsh, PC toll-free at 888-419-2229. You may also press the Live Chat tab to the left of your browser or complete this online contact form. A number of different forces can result in birth trauma to a baby. Sometimes these are forces that occur during the process of labor itself. Other times, they are due to forces applied by doctors or nurses during delivery. Some of the most common forms of birth trauma include intracranial hemorrhages and skull (cranium) fractures. Cerebral hemorrhage: This type of bleed is a form of stroke where there is a rapid loss of brain function due bleeding within the brain itself. This includes intraparenchymal hemorrhage (bleeding within brain tissue which may cause a hematoma which expands inside the brain, pushing aside adjacent brain tissue and compressing it) and intraventricular hemorrhage (bleeding into the fluid filled areas – ventricles – of the brain where spinal fluid is produced. It is the most serious type of intracranial bleeding and is most common in premature infants who were exposed to stress from respiratory distress syndrome, high blood pressure, or abnormal amounts of air or gas in the lungs which causes lung collapse). Epidural hemorrhage: Bleeding that occurs between the dura mater and the skull bone. This is a very dangerous type of injury because the bleed is from a high-pressure system and deadly increases in intracranial pressure can result rapidly. significant due to the high incidence of irreversible brain damage associated with this particular type of hemorrhage. Subarachnoid hemorrhage: This is the most common type of intracranial bleeding following birth trauma. It is bleeding in the subarachnoid space, which is the area between the arachnoid and pia membranes that surround the brain. Seizures are likely within 48 hours of birth and the baby is usually lethargic with the appearance of a stiff neck. Cephalohematoma: This is a hemorrhage of blood between the skull and the membrane that covers the skull, which occurs after rupture of vessels near this membrane. Some of the signs and symptoms associated with intracranial hemorrhages include lethargy, seizures, abnormal eye movement, blue skin color, apnea (pauses in breathing), decreased muscle tone and reflexes, problems feeding. If these symptoms are present and a brain bleed is suspected, brain imaging studies (CT scans, MRIs) are usually performed to confirm blood within the skull. A skull or cranial fracture may occur as a result of a traumatic birth. The skull is comprised of small bones (frontal, parietal, temporal, occipital, sphenoid, and ethmoid bones) all connected to each other. These bones may be fractured or pushed in as a result of the natural forces of labor and delivery or from a number of complications during delivery. There are three types of skull fractures that can happen during delivery. These are linear, depressed, and occipital osteodiastasis. Linear skull fracture: This is a break on the cranial bone that appears as a thin line. There are no depressions or splinters and generally occurs on the parietal bone but can also happen in the frontal and occipital bones. It sometimes occurs with a cephalohaematoma and is often caused by delivery instruments such as a vacuum extractor or forceps. Depressed skull fracture: This occurs when the baby’s skull is crushed inwards toward the brain and forms a depression. It is often associated with cephalopelvic disproportion where the baby’s head is continuously forced against the mother’s sacral prominences (bones of the pelvis). Depending on the severity of the depression, surgery may be required to raise the sunken bone. Surgery is necessary if bone fragments are present in the cerebrum to minimize neurological damage. Occipital Osteodiastasis: This is a rare complication during delivery where there is a traumatic separation of the squamous and lateral parts of the occipital bone with laceration of the occipital sinus. Blood then pools in the posterior fossa (the part of the brain that contains the brain stem and cerebellum). Typical signs and symptoms associated with infant skull fracture include seizures, apnea or bradycardia (slow heart rate), respiratory distress, hypothermia (low body temperature), full fontanel, and swelling of the scalp. A fetal stroke is a serious condition that involves a sudden disruption in the blood supply to the brain either from a blockage or the bursting/breaking of a blood vessel. This starves the brain of oxygen-rich blood and causes nerve cells to become damaged and die. This alters aspects of a baby’s functioning such as movement, speech, learning, and behavior. Weakness and one-sided paralysis is also possible. Fetal stroke is many times caused by traumatic birth including the stretching and tearing of brain vessels during vacuum or forcep deliveries and prolonged labors. Signs and symptoms of neonatal stroke in newborns and infants include: seizures, irritability, vomiting, bulging fontanelle, and loss of consciousness. The risk for fetal stroke from birth trauma is minimized when physicians follow standards of care and effectively diagnose and treat complications known to cause head trauma during birth such as CPD and prolonged labor. Cephalopelvic disproportion (CPD) is a condition where the baby’s head is too large to easily fit past the mother’s pelvis during labor and delivery. As a result, the prolonged periods of contractions and pushing force the baby’s head and brain repeatedly against the mother’s pelvis causing bleeds and fractures. Women with a small or abnormally shaped pelvis are at increased risk. Causes of CPD include a large baby (macrosomic) from such things as gestational diabetes, postmaturity (past pregnancy due date), and a previous pregnancy. When CPD is diagnosed, the safest method of delivery is a C-section. A breech birth occurs when the baby enters the birth canal with the buttocks or feet first, as opposed to the normal head first presentation. There is a risk of birth trauma, namely intracranial hemorrhage, with vaginal breech delivery. In a breech birth, the head comes down the birth canal after the body and doesn’t have the chance to mold before passing through the birth canal. If the baby is premature or small, there is a risk that the body delivers easily leaving the head trapped behind an inadequate pelvis or incompletely dilated cervix. This may cause significant trauma to the baby’s head and brain. The risk increases when assistive delivery instruments such as forceps or vacuum extractors are used. C-section is almost always ordered in cases of a breech position. Forceps resemble large salad tongs, and are placed on either side of the baby’s head. As each contraction occurs, the physician guides the baby’s head downward and out of the birth canal. Correct placement of the forceps is critical to avoid compression of the head resulting in brain bleeds, cranial bone distortions, brain swelling, and brain damage. A vacuum extractor uses a small, soft suction cup applied to the top and back of the baby’s head. A tube runs from the cup to a vacuum pump that provides suction. During a contraction, the physician gently pulls the baby’s head while suction from the vacuum assists in delivering the baby. Trauma may occur if the suction cup of the vacuum extractor is not placed correctly, if there is twisting of the head or neck by the doctor, or if there is excessive pulling. Also, if the vacuum extractor pops off too many times during use, the physician should move on to a C-section to deliver the baby. Improper use of vacuum extractors and forceps can cause brain damage from brain bleeds, cerebral contusions, stretching and tearing of blood vessels in the head, compression of the brain with changes in blood flow, and/or skull fractures. These in turn may lead to cerebral palsy, seizure disorders, and other disabilities. Labor generally lasts 12 to 18 hours for first time mothers and about 6 to 8 hours for subsequent pregnancies. There are three stages of labor: The first stage which is from the onset of labor – when contractions begin – through the time the cervix becomes fully dilated; the second stage which covers the time from full dilation through delivery; and the third stage which includes the delivery of the baby through the delivery of the placenta. When the first and second stages of labor extend beyond 18 hours, the labor is said to be “prolonged.” This can be due to such things as cephalopelvic disproportion (CPD), breech presentation, or other problems related to uterine contractions. Regardless of the suspected reason, an obstetrician needs to quickly deliver the baby via C-section in order to minimize the risks of intracranial hemorrhages, hypoxic ischemic encephalopathy, and other injuries. Once the cervix reaches dilation of about 4 cm, more rapid labor begins. During this active labor phase, the cervix should continue to dilate at a rate of at least 1.2 cm/hour (for first babies) to 1.5 cm/hour (for subsequent babies). An active labor that progresses slower than this is considered an “arrest of labor.” A partial arrest means labor has simply dropped below the expected rate. A complete arrest is when there is no further progress for at least 2 hours. 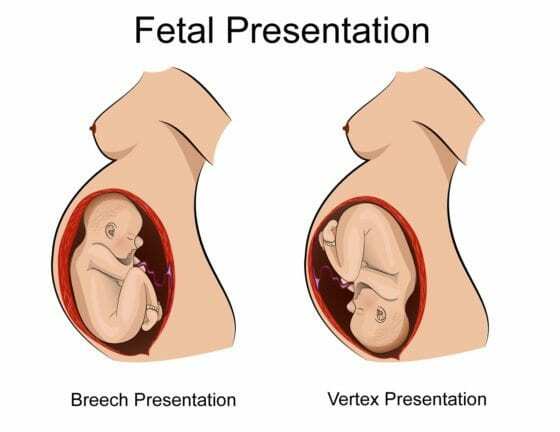 An arrest of labor is due to inadequate (too infrequent or not long enough) contractions or an internal barrier to labor such as cephalopelvic disproportion or fetal malpresentation (eg: breech or face presentation). When there is an impediment to delivery, a C-section is generally done in order to deliver the baby quickly and minimize the risk for trauma related injury such as intracranial hemorrhages and fractures. It is crucial for physicians to carefully monitor a mother and baby during pregnancy, labor, and delivery and to prevent or treat conditions that can lead to any of the complications that may cause traumatic injury to a baby. Failure to do this is negligence, and when negligence leads to injury, it is medical malpractice. 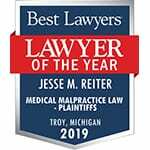 The experienced attorneys at Reiter & Walsh ABC Law Centers have been helping families nationwide affected by traumatic birth. Our Detroit, Michigan birth trauma attorneys are highly regarded in the field of birth injury law and have a track record of multi-million dollar verdicts and settlements that attest to their successes. If your child has been diagnosed with cerebral palsy, seizures, or other disabilities due to birth trauma injuries, call Reiter & Walsh ABC Law Centers today for a free consultation at 888-419-2229, complete this contact form, or press the Live Chat button to your left. “Intracranial Hemorrhage (IVH),” MyChild at CerebralPalsy.org, 7/2/13. “Hemorrhagic Stroke,” The Children’s Hospital of Philadelphia, Rebecca N. Ichord, MD, October 2006. “Birth Trauma,” Nirupama Laroia, MBBS, MD; Chief Editor: Ted Rosenkrantz, MD, 11/26/12, Medscape Reference. “Cephalopelvic Disproportion,” American Pregnancy Association, 5/07. Danforth’s Obstetrics and Gynecology Ninth Ed. Scott, James R., et al, Ch. 22.